The lupus panel measures blood markers related to systemic lupus erythematous (SLE). What is the lupus test panel? This lupus SLE panel measures the ANA, chromatin antibody, complement components C3C and C4C, complement total (CH50), DNA (ds) antibody, RNP antibody, Sjogren's SS-A and SS-B antibodies and Sm antibody blood levels. Why is the lupus blood test panel important? The SLE lupus panel can help identify abnormal lab markers that help screen for lupus. This Lupus Test Panel is a blood test. The lupus test panel, also known as a lupus panel, SLE panel test, SLE test and a SLE lab panel, measures blood markers related to lupus. This lupus blood test panel includes the ANA test, chromatin antibody test, complement component C3C test, complement component C4C test, complement total (CH50) test, DNA (ds) antibody test, RNP antibody test, Sjogren's antibody panel, and Sm antibody test. Lupus, also known as systemic lupus erythematosus and SLE, refers to a class of diseases in which the immune system becomes hyperactive. Also thought of as a type of autoimmune condition, lupus presents with a variety of symptoms ranging from joint pain to rashes, fatigue, ulcers and swollen lymph nodes. No curative treatment exists for lupus and most therapy is focused on reducing the frequency and/or severity of symptoms with drugs that suppress the immune system. To get a lupus test panel near you, simply order online and get your blood drawn at the Quest Diagnostics lab near you. 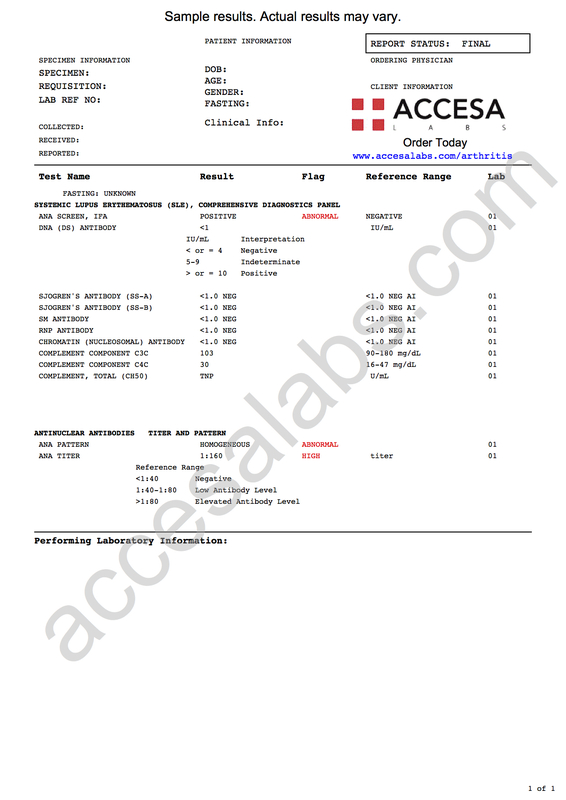 Once your lupus panel lab report is ready, it will be available for download. As can be seen on the sample lupus panel lab results, the lupus test components will be reported as numerical values and can be compared against the reference range provided by the lab. Lupus Test Panel at Guaranteed Prices.